Dropped in to see my friends from Kanaga System Krush busy editing a long awaited documentary on the music of Mali, West Africa. Called Life is Hard, Music is Good, it seems likely to set a new standard for documenting African music and the lifestyle that goes with it. Editing might be the hardest part of this venture six years in the making. Blessed or cursed, depending on your view, with a wealth of riches in terms of footage captured, a few hundred hours at least, the challenge now is to get it down to a two hour running time. The editor is Margaret Byrne whose credits include Mary J. Blige and Black Eyed Peas. Director of Photography David Nicholson had another editing station set up and was busy with P.J., one of the Producers, sorting through and compiling archive footage for inclusion. Somebody asked me, "what's happening?" "This is IT! This is what's happening," I replied. I felt in the middle of a media laboratory involved in experiments with very high energy particles & waves imaging sound & vision. Collecting, organizing, assembling and reframing discrete moments of time and experience. Cohering to a vision that tells the story of music that keeps a culture together (most of the time), spiritually thriving, vitally and magically alive. This music, the music of Mali, like all genuine music, transcends hardship to a greater or lesser degree. Life is hard, music is good. Editing is hard. Communicating a musically rich culture is good. The editing suite spilled out into an outdoor terrace shaded by a couple of oak trees. A long wood bulletin board ran the length of one side displaying cards depicting the various people and elements making up the film. They were vertically divided into categories under the headings of different themes. Not quite a storyboard but still quite a comprehensive layout of the form of the film. KSK head honcho Aja Salvatore could be found fashioning a djembe on the terrace when not making executive production or directing decisions. Aja was aided and abetted by a djembe player from Mali, Seydou who had recently acquired his visa to live here after trying for years. always showed me great respect and friendship once giving me a traditional shirt as I was leaving. The last time I saw him, about 2 1/2 years ago, I gave him a very basic Brane Power beta blocker, a small quantum crystal radio designed by E.J. Gold. It's a biofeedback device meant to help cancel the brain's beta waves, ie headbrain chatter that' gets in the way of more relaxed states. I showed him how he could use it to increase his will power. I guess it worked! The temperature was Africa hot. A little more humid than usual compared to the sub-Saharan climate of Bamako, Mali, and it felt nowhere near as dusty as it gets there but still the kind of hot you take notice of and have to deal with. But if you've worked in Africa for any length of time then you know how to deal with the heat. Aja finished shaving the hair off the goat skin drum head he had stretched over the djembe shell then he and Seydou tuned it up. The only thing left to do now was play it. Aja started playing one of the more traditional African rhythms he picked up in Segou, capital of the Bamana Empire in thje 16th Century. Seydou started playing what I thought was a small dun dun (African bass drum) with a stick mallet. In his left hand he held a metal bell with a metal striker on one finger like a ring. They worked up a deep African groove that sang through the sedate residential streets sounding like a call to go on a mystical journey. Some people passing with big smiles excitedly said they could hear the drumming all the way from the top of the hill. In Bamako it's common to hear drumming going on somewhere in the distance. I once asked someone there why so much drumming and he said that they often do it for some particular intention. To drive away bad spirits from someone or find something that's lost, to change the weather or give blessings at a wedding etc. etc. Nevada City had a little taste of Africa in their midst. Aja and Seydou ostensibly intended to test the sound and playability of a newborn djembe - which sounded great, by the way, clear, articulate, tonal and confident. But I suspect the African ambience they created indirectly fed the editing process by creating a specific mood of the homeland outside of the pixellated and digital electronic quantum world where the documentary was taking shape. I'm looking forward to mixing the audio. "Biographer Robert Hillman says Mr Yunupingu had a great sense of mission about his people. "It was part of his vision that music could become a political agent in making broad mainstream Australia more aware of the rich Indigenous culture of his people." Bill Laswell and I had the great honor to work with him and Yothu Yindi at the beginning of 1993 in Sydney, Australia. The pressure around Mandawuy was intense at the time. He had just been named Australian of the Year for 1992. This had triggered a wave of racist invective directed against him. A popular, Rush Limbaugh-like radio mouthpiece led the charge saying that the only reason he had received this accolade was because he was black. Protesters demonstrated against him. I remember seeing some footage of them on the news. All this was going on as Yothu Yindi started recording a new album. Mandawuy seemed noticeably affected by this racist nonsense yet it didn't slow down his drive to document their new music. He had a core strength of being that didn't waver from his purpose. He also knew magic. 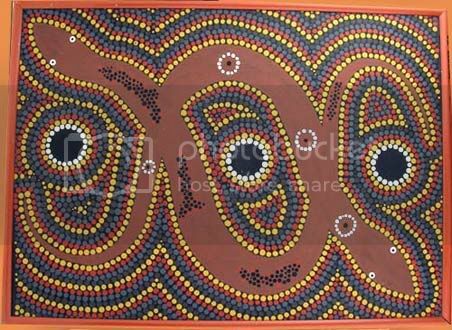 Early in the project Yunupingu placed a circular, orange and white ritualistic headband on the top center of the mixing console and said, "this will give it some magic. Later, I asked him the significance of this talisman. He said it was "Baywara," and emphatically stated, " This is my Mother. She is the most powerful one ever. I am the child and she is the Mother." In the Yolngu language Yothu = child, Yindi = mother. Mandawuy also called Bill "Baywara" and said that he was the "Man from Nothing." My initial experience with indigenous Australians took place on a trip there a few months earlier. Bill brought me down there to help with some remixes for the band Icehouse. They also recut a new version of their hit song Love in Motion as a duet with Icehouse lead singer Iva Davies and Christina Amphlett of the Divinyls. We worked at the EMI studio in Sydney. At that time, normally Autumn of 1992, but down there it was Spring, Yothu Yindi was at the top of the pop charts. They were the first to incorporate and blend traditional indigenous music with Anglo pop music forms. It went over very big. That inspired Iva Davies to use that sound on the remix of their signature song Great Southern Land. Unfortunately, Davies didn't know any native Australians who played traditional music. Someone had the idea to go to one of their settlements, areas that were exclusive to the Indigenous. These reminded me of Native American reservations. These settlements required a government permit to visit that normally took months to obtain, however, Davies was able to circumvent the red tape. He acquired our permission to visit in a few days. I assembled a portable recording rig to take into the Outback basically consisting of the same gear I brought to Morocco to record the Master Musicians of Jajouka except we didn't bring a generator. Laswell, Davies, and I took a commercial flight up to Darwin, the most northerly city in Australia with a short stop to refuel in the centrally located Alice Springs . We spent the night in Darwin. The next morning we loaded our gear onto a small, 4 seat propeller plane and flew to the Galiwin'ku native settlement on Elko Island. We were told that the only way in or out was by plane. An official looking 4 wheel drive Land Rover station wagon picked us up at the landing strip and drove us to an empty house in the community where we would spend the night. The settlement seemed very surreal, like something out of a Jodorosky film. The most anomalous aspect was its resemblance to an inner city slum yet surrounded by beautiful countryside and wilderness. It also reminded me of the Old West. The heat was intense. So hot it seemed to make time slow down and crawl by. There was one all purpose general store, relatively large, about the size of a supermarket. It didn't have regular hours but there was a rumor that it would open at 1pm. At 1, people started gathering outside and waited until it finally did open at about 2:30. Though the store was large, many of the shelves were bare or only had a few items. We walked around the community looking for some musicians to connect with but without success. That night a group of musicians showed up at our house and said they had some songs for us to hear. I quickly set up some mics and the recording equipment. They played about 5 or 6 original pieces. The multi-track recordings turned out fine, but Bill didn't find any of the music suitable for what we were doing except for solo didjeridoo playing which we used extensively. I ended up putting one of their songs, Marralyil, in a collection of ambient recordings, All Around the World. We didn't get their names so I was only able to credit the place, Elko Island. The house we stayed in was completely empty except for a kitchen table, a few chairs for it, and a fridge. Bill and I slept on floor that night. Iva Davies slept on the table. We left early the next day. It was a long way to go to get some didjeridoo samples but quite worth the adventure, in my opinion. Flying back in the prop plane we spied some kangaroos running about their natural habitat. A few months later, back in New York, Bill got a call from Yothu Yindi's Australian label, Mushroom Records, asking for his help with producing their next album. This Yothu Yindi project became a classic case of something very positive trying to come into existence against all kinds of resistance. Eventually the resistance won, but not on our watch. I'll explain later. To start with, uncertain financial concerns with the label nearly scuttled the mission before it began. It still wasn't resolved the day of my flight to Australia. Two hours before I needed to leave for the airport the call from Bill's office came through that the trip was on. I was confident that it was going to happen and Bill must have been too as he had gone down a few days earlier to work with Mandawuy in his home in the Outback. The flight from New York to Sydney, Australia incurs the worst jet lag I've ever experienced. Also, my bio-chemistry had been sensitized by shamanic experiments I'd been doing with the floatation tank that week. This made my first day there physically and metaphysically quite uncomfortable and disorientating. I felt like I'd been beamed down to another planet like in Star Trek only my body didn't fully materialize. My consciousness seemed partly there and partly scattered through vast regions of space. Fortunately, I had a couple of days to recover before Bill arrived from the Outback. We were booked to work at EMI's Studio 301 again, the longest running recording studio in the southern hemisphere, established in 1926. We also stayed at the same hotel as before, The Southern Cross - coincidentally the name of a favorite chapter from Crowley's Book of Lies. I had recently purchased The Equinox, Crowley's ten volume periodical publication that held all varieties of occult wisdom. I brought Volume I with me and spent my time waiting for Bill reading John St. John, a record of Crowley's "Great Magical Retirement" in Paris. One point of that essay showed that a person could do intense magical work while still living a normal and social outward life. Consequently, I decided to visualize and invoke the godform Mercury as much as possible during this period of recording Yothu Yindi. The primary prayer I used was the Invocation of Mercury from Crowley's Rites of Eleusis. Mercury functions as the god of communication among other things. "For the ceremonial magician, each god can provide a subjective and easy-to-visualize image of a specific aspect of his or her own complex psycho-spiritual nature. To enter into a working relationship with a god (invocation, evocation, exaltation, prayer, etc.) is to contact, activate, assimilate, or direct the particular facet of one's own being personified by the god." This unique combination of working with magick, Indigenous Australians, Bill Laswell and being in Australia made this one of the most remarkable and life-changing recording trips that I'd ever been through. I felt peculiarly energized. I didn't slept more than 3-4 hours a night the whole two weeks we were there. Here I'm attempting to describe the undescribeable, to eff the ineffable regarding my impressions of contact with this ancient culture. According to DNA evidence they descend from the first humans to leave Africa. Archaeological evidence places them in Australia 50,000 years ago. Working with Gurdjieffian Fourth Way material over the years has given me an appreciation for the difference between "personality" and "essence," or between the superficial and the real. Most of us programmed with the socio-cultural values of the West operate primarily out of personality. One of the agendas of the Fourth Way, as I see it, seeks to quiet the personality down enough through various practices so that the deeper perception and wisdom of our real self, our true self can come through. For the Yolgnu, it appeared exactly the opposite. They seemed already naturally there, coming from a place of being, consciously connected to their deepest essence. Yet they seemed to be trying to fit into the world of personality, to acceptably blend in with the dominant Anglo social conventions. Mostly they did this by drinking a lot of beer. This caused me to reconsider several ideas I had regarding Gurdjieff''s work. These Yolgnu musicians were already there. They obviously hadn't done elaborate exercises of self-observation and self-remembering or practiced any other Fourth Way psychological techniques to manifest their powerful state of being. I attributed it to their natural cultural upbringing. They hadn't been corrupted by modern education or media brainwashing. However, this seemed to result in a certain kind of discomfort for them. My initial conclusion jumped to: Fourth Way exercises appear a sort of con. Then I recalled a rumor that Gurdjieff's primary mission involved introducing certain music to the West. The psychological system he introduced seemed deliberately designed to appeal to and attract the Western mind with it's strong emphasis and faith in intellectual ideas. The Fourth Way system didn't seem necessary or relevant to this ancient culture strongly connected to its roots. Bill encouraged the Yolgnu to bring artifacts, ritual items, and mementos from their culture into the studio to give it "vibe" ie to make the environment invocationally resonant. They didn't disappoint. The whole studio transformed into a shamanically conducive, nonreligious temple or holy ground of sorts. They brought two banners about 15' long and 4' high and hung them high on the walls of the control room, one on each side parallel with the mixing desk. The banners were covered with indigenous traditional artwork. After working about ten hours, I would look up at this art and it would appear pulsating and breathing with life. It got a bit unnerving at times as I would feel surrounded by nonhuman, interdimensional life forms that seemed much bigger and more vast in scope than anything I was familiar with. Like stepping in or having a direct view of what Carlos Castaneda calls the Nagual - an observable realm outside known reality.